Indelible Grace Music: Joy Beyond The Sorrow Available Now! Keep up to date with the latest Indelible Grace news including tour dates in your area. Get sheet the music, chords, lyrics, and slides to all of the Indelible Grace hymns. 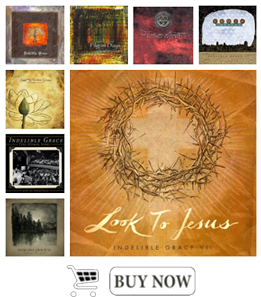 Listen to streaming tracks from all of the Indelible Grace albums. Keep up to date with the latest tweets from Indelible Grace founder Kevin Twit. "Our hope is to help the church recover the tradition of putting old hymns to new music for each generation, and to enrich our worship with a huge view of God and His indelible grace." Indelible Grace Music grew out of ministering to college students, primarily through Reformed University Fellowship (RUF). As these students began to taste more of the depth of the gospel and the richness of the hymn tradition, many began to join the music of their culture with the words of our forefathers (and mothers! ), and a movement was born. Our hope is to be a voice calling our generation back to something rich and solid and beyond the fluff and the trendy. We want to remind God's people that thinking and worship are not mutually exclusive, and we want to invite the Church to appreciate her heritage without idolizing it. We want to open up a world of passion and truth and make it more that just an archaic curiosity for the religiously sentimental. We believe worship is formative, and that it does matter what we sing. Ultimately, we want to nurture a movement and hope this site will provide resources for this. ©2012 Indelible Grace Music, All Rights Reserved.